What Is It About The Fall Season That Makes One Get Hungry For Pumpkin? I guess because this is the time of the year that pumpkins start to show up in grocery stores and in roadside tents that dot the country side. The air is a little cooler and in anticipation of Thanksgiving, there is the all American, every loving, pumpkin pie. There are so many other recipes for pumpkin that delight our taste buds. At a local fair I had pumpkin funnel cakes; out of this world. Our doughnut shops are now producing pumpkin muffins with delicious toppings. 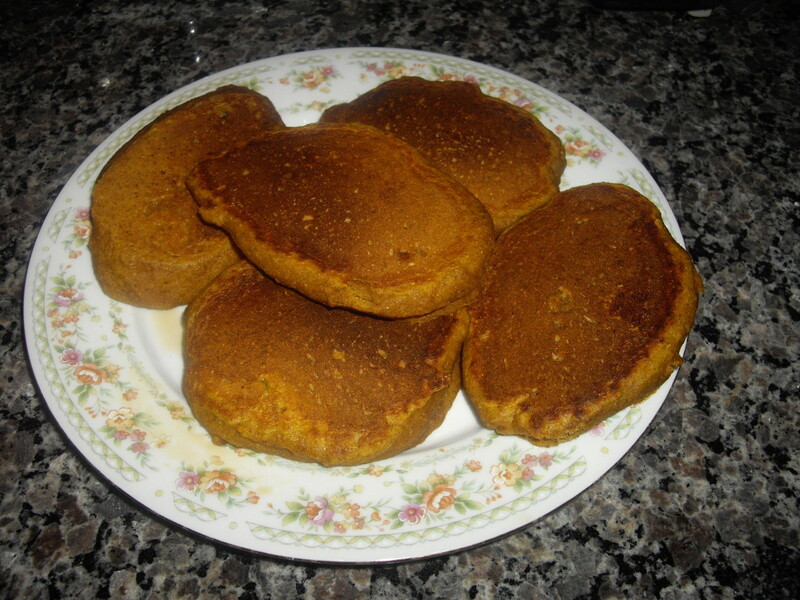 Two of my recipes today in this hub are pumpkin pancakes and pumpkin bread. Both are moist and delicious and super easy to make. Hope you enjoy! Weight Loss: Pumpkin is low and calories and just about no fat and rich in fiber, keeping you fell full longer. Sharper Vision: Pumpkins orange coloring comes from a rich supply of beta-catotene, which gets converted into vitamin A in the body which is essential for eye health and helps the retina absorb and process light. (Carrots are great for that also). Better Immunity: The large amount of vitamin A pumpkin produces also helps you body fight infections, viruses and infectious diseases. Pumpkin oil even hlep fight various bacterial and fungal infections. Younger Looking Skin:The beta-carotene also helps us from the sun's wrinkle-causing UV rays. and the pulp also makes a great face mask that exfoliates and soothes the skin. All you need is 1/4 cup pureed pumpkin, an egg, a tablespoon of honey and a tablespoon of milk, miss it the apply to your face and wait for 20 minutes then wash it off with warm water. Fighting Cancer: Beta-Carotene is also beneficial to that. 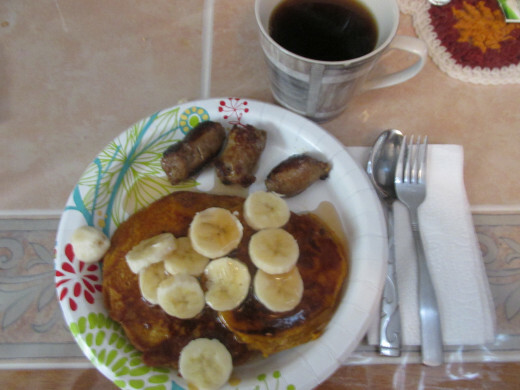 Pumpkin Pancakes Courtesy of Sandra Lee- Semi Homemade Cooking. In a medium bowl, whisk pancake mix, water, pumpkin, cinnamon and ginger until just blended (do not overmix; batter should be lumpy). Spread butter over a hot griddle or large frying pan. At medium heat spoon batter onto griddle to form each pancake. Cook 2 minutes or until bubbles appear and then burst and then flip the pancakes and cook 2 minutes longer or until golden in color. 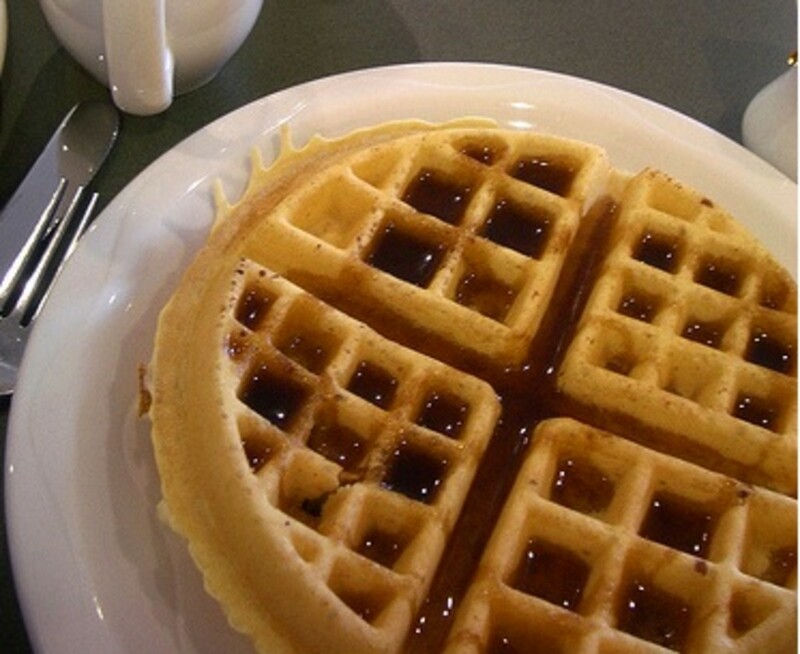 Serve hot with your favorite topping or syrup and/or butter. 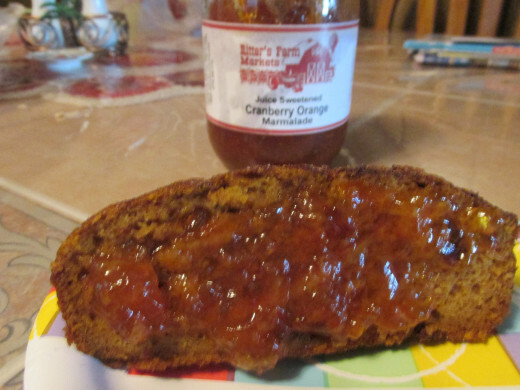 This pumpkin bread is pictured here with cranberry orange marmalade, and it was heavenly. Other toppings that pair good with it is whipped cream cheese, butter, orange marmalade or even applebutter. 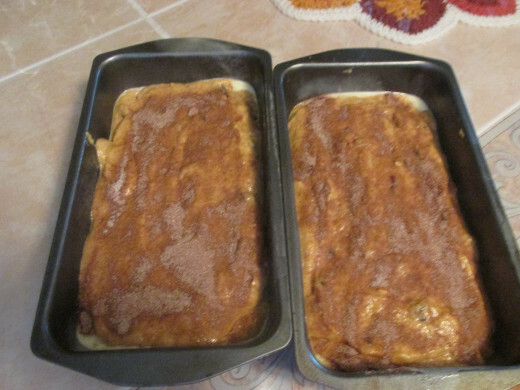 *I used 1/2 cup oil and 1/2 cup orange juice Preheat oven to 350 degrees Cream sugar and oil. Add eggs, pumpkin and mix well. In a medium bowl, sift the flour, baking soda, salt, baking powder, and spices. Add the cranberries to the dry mix. Add to pumpkin mixture, mixing well. Add the water and mix well. Thank you for the update, Pat. I will keep praying. Remember, nothing is impossible with the Lord. God bless you all. Hi Pat, lol I will let you know.. But you are welcome any time. Hi Pat, so nice to hear from you. I have not forgotten you, my friend. Hi Rachel...I have read this before but just wanted to stop in and say Happy New Year and wishing for you prosperity and good things. It has been too long since we visited. You may, Sujava, I would love to give you the first slice or the first pancake. But, instead, do you know someone who could make this recipe for you? I try to make my recipes so that anyone could follow them. Thanks for the comment. Oh, thank you poetryman, You're so sweet. I am not like Peter Peter Pumpkin Eater. I generally regard humongous gourds as something fit to scare to youngins. Thanks, aesta1. I'm sure you'll like it. I appreciate the visit. Just perfect for thanksgiving. I want to try the pumpkin bread. Ok so I HAVE read this before but seeing the photo made me smell this cooking....love this time of the year...all of the wonderful flavors and aromas.....yum. Hi Emese, You're so welcome. I'm sure you'll like them, easy to make too. I was just looking for a yummy pumpkin bread recipe, and here it is! :). The pumpkin pancakes look great as well, I'll probably make them sometime. Thank you, Rachel for sharing these. Hi Alicia, Always nice to see your visits and comments. Thanks a lot, I appreciate it. 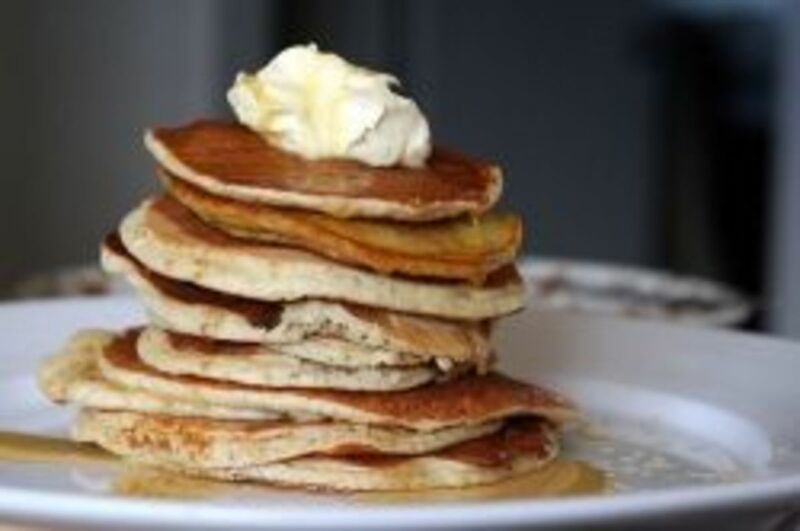 These sound like lovely treats for fall - especially the pancakes! As always, thanks for sharing the recipes. Hi Pat, Thanks so much for the visit. You'll love these and they are so easy to make. Hi Purl3agony, They are so easy to make too, especially with the pancake mix. Of course, if you like you could always make them from scratch. Hope you enjoy them. 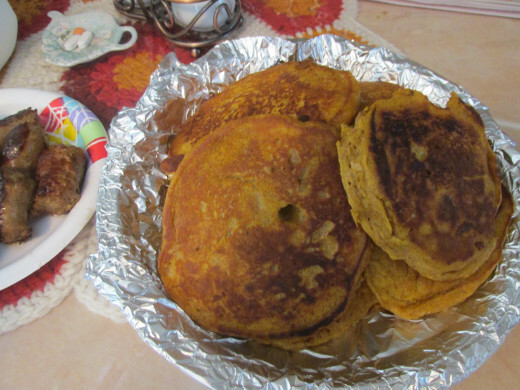 Pumpkin pancakes are one of my favorite fall treats, but I've never made them myself. Thanks for sharing these wonderful recipes! Hi Jackie, thanks for the visit and comment. That's an idea, I think I will look for a pumpkin funnel cake recipe. The one I had was from a fair I went to. Thank you Thelma, I think you like them if you like pumpkin. These sound great and hope you are looking for that funnel cake recipe! This comment went twice so I deleted one. This sounds delicious. I have not made or eaten pumpkin pancakes. Thanks for sharing the recipes.